My name is Don Matschull. I have spent decades working with hundreds horses and riders. I have ridden ranch horses in Wyoming, including camping in the Absaroka–Beartooth Wilderness and helping move cattle over the Continental Divide. I have also performed High School movements on Lusitano stallions in Portugal. I often work with horses people no longer wish to ride, trying to reassure these horses that being ridden need not be an uncomfortable experience. I have learned that horses are very giving animals. While they respond to a variety of cues, they respond best when ridden with tact and consideration. I have studied numerous methods of working with horses. I have read dozens of books on various aspects of horsemanship. Many of these are listed on my companion web site www.quietriding.org along with links as to where they may be purchased. That web site, also, contains reviews of some of these books as well as sample quotations from the authors. My desire is to share what I have learned with others so their learning process may be easier than mine has been. I have set up these two web sites with that in mind. I have tried to make these sites adaptive to a variety of viewing devices and screen sizes. Please let me know if you have any trouble viewing or navigating the pages of these sites. If you have found the information on this site useful and would like to learn more, please consider purchasing one of my books. Both are available in either paperback or electronic format and may be purchased through the links provided. If you would like to purchase a greater number of books at a discount for use in riding classes, please contact me at dmatschull@quietriding.com. 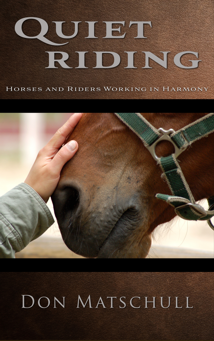 Quiet Riding: Horses and Riders Working in Harmony was my first book in which I sought to share my decades of research and experience. I wanted to help riders learn more quickly many of the aspects of riding which it had taken me so long to learn. Dream Riding A Real Horse: Riding As You Dreamed It Might Be is my second venture, expanding on the thoughts and techniques presented in Quiet Riding but from a slightly different perspective. Through working directly with more riding students and participating in forum discussions with people from all over the world, I have gained a broader perspective of the issues faced by a wider range of riders. I have discovered regional as well as disciplinary influences that have effected their approach to riding. But a common theme seems to be the fact that people's riding experience does not match the riding they had envisioned for themselves and their horses. 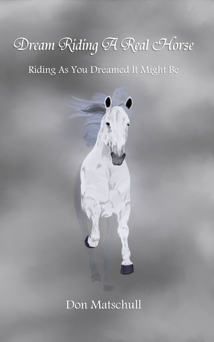 In Dream Riding A Real Horse, I seek to help readers transform their everyday riding to make it more like the riding they had imagined where their horse responds quickly and willingly to their very thoughts. I currently work with both riders and their horses to establish better relationships and create better riding through progressive development and lighter cues. Still, I am often free to travel if you would care to arrange private lessons, clinics, or group discussions. You may contact me through any of the methods listed in the contact section. I also sell prints of my digital artwork. Please contact me if you are interested in having me produce a commissioned work of your favorite horse or horses. While I do not have a discussion section on this web site, I do participate in various forums such as: Horse Forum.com, My Horse Forum, and the Spalding Laboratories horse forums. While I reserve the rights to the text and images on this site, I encourage visitors to try the methods described with the horses they ride and to share these ideas with others.